I’m so torn on the topic of ebooks. My husband gave me a Kindle Fire for Christmas and I’ve had a hard time deciding if I like it or not. The two biggest perks I’ve found with it are that I can read in the dark without needing a reading light and that it is light weight which makes travelling with it super easy. My negative list is a bit longer. I’m a big fan of checking books out from the library. Unfortunately, many of the titles that I’m interested in reading are not available in ebook format from the library. I miss browsing through a library, picking up a book, flipping through it and deciding if I want it on my must read list. Most of all, I miss holding a real book in my hands! It’s scary to me that bookstores continue to shut their doors. So, what about ebooks for children? Will I someday cuddle up with my boys and an ebook version of Green Eggs and Ham? It seems so odd to me that I might read a book without turning the pages and not enjoying that library book smell. Do ebooks have a place in children’s literature? Ebooks for children are rapidly becoming more available. Up until recently, they were limited to chapter books and text books. Now, you can find many picture books available and on top of that they are interactive with sound and other enhancements. However, do all these bells and whistles detract from the pure pleasure of reading a book? 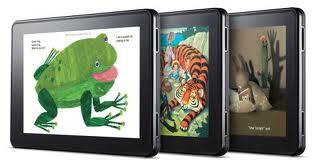 Might ebooks motivate children not very interested in reading? As a teacher and administrator, I have found that technology can be a great motivator for students who might not otherwise be interested in books. On the other hand, are we just continuing to promote the downfall of interacting with “real” books? Classrooms or schools with limited libraries also find ebooks helpful for getting students to interact with print. There are a variety of websites that allow access to digital books and literacy activities for free or a minimal fee. Some schools are now doing away with textbooks and issuing ereaders loaded with ebooks. So, what do you think? Will ebooks replace hardcopy versions of books? What role do ebooks play in your life? Please share your thoughts! I appreciate your concerns with the growing use of e-books and whether that portends the end of print books in the future. My short answer: no. I don’t think e-books means that libraries will close down or that there will no longer be any bookstores to go to. I do think it’s a great alternative to print books for some things. In fact, I’m glad that not all books are available as e-books and there are some, like professional books, that I prefer to have in my hands. On the other hand, I prefer to have novels on my Kindle. I like the fact that it cuts down on paper books since I have too many already! I like that I can download a sample of a book and browse it before I decide to buy it. I’m not a big fan of the bells and whistles books for kids, especially. I prefer that books for kids remain centered around the book as it was originally planned by the author. So, the bottom line is that this is another way to read books. I don’t see it as better or worse, just different. I’m glad there is a choice; I don’t think that will change. Elsia, you bring up some great points. Thank you so much for sharing!